During the opening segment of her Fox News show Justice with Judge Jeanine on Saturday, former judge and prosecutor Jeanine Pirro blasted Sen. Kamala Harris (D-CA) for likening the Immigration and Customs Enforcement (ICE) agency to the racist Ku Klux Klan (KKK). 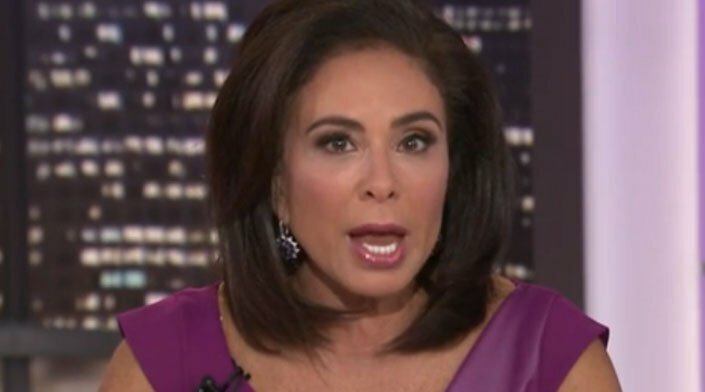 Pirro’s remarks came after Harris implied that ICE uses racially-motivated violence to force political change — much like the KKK — during a Senate Homeland Security and Governmental Affairs Committee hearing last week to confirm President Donald Trump’s latest nominee to run the immigration enforcement agency. “Are you aware of the perception of many about how the power and the discretion at ICE is being used to enforce the laws? And do you see any parallels?” Harris asked acting ICE Director Ronald Vitiello. The early Klan didn’t just target recently freed blacks with lynchings and terror campaigns. The hooded terrorists also intimidated and murdered Republican Party leaders and abolitionists who sought equal rights for African-Americans. Despite Democratic attempts to obscure their relationship with the KKK, there is no denying that the two groups had overlapping political agendas in the Reconstruction and Post-Reconstruction South. Pirro went on to insist that Harris was engineering a “con” job on the American public. She said that if illegal immigrants are afraid of ICE, then America’s laws are doing their job. Pirro then flashed a number of images across the screen of the recent victims of illegal immigrant murderers. Later, Pirro was joined by Trump spokeswoman Kellyanne Conway, who agreed with her host regarding Harris’ controversial comparison. And conservatives like Judge Jeanine aren’t standing for it.